This abstract base class provides an interface to time-dependent spatial coefficient data for various partial differential equations. One obtains constant access to coefficient data by specifying the desired time centering. Subclasses of this base class define how that coefficient data is computed. LevelDataType The LevelData type used to store coefficient data. Returns the number of components in the interpolated coefficient. Base class constructor. Called by every subclass. a_numComps The number of components in the interpolated coefficient. References CoefficientInterpolator< LevelData_, SolutionLevelData_ >::m_numComps. Interpolate the coefficient at the given time, placing the result in the given LevelData object. This method must be overridden by subclasses. a_result The LevelData object that will store the result. a_time The time at which the coefficient is to be evaluated. References CoefficientInterpolator< LevelData_, SolutionLevelData_ >::dependsUponSolution(), MayDay::Error(), and CoefficientInterpolator< LevelData_, SolutionLevelData_ >::m_inCall. 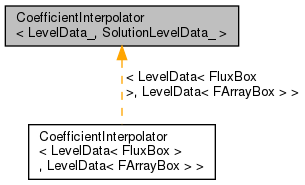 Referenced by CoefficientInterpolator< LevelData_, SolutionLevelData_ >::interpolate(), and CoefficientInterpolator< LevelData_, SolutionLevelData_ >::NewtonRaphson(). Interpolate the coefficient at the given time, placing the result in the given LevelData object. This method assumes that the coefficient depends upon the solution to the partial differential equation in question, so the solution is passed into it as an argument. a_solution The solution to the partial differential equation. References CoefficientInterpolator< LevelData_, SolutionLevelData_ >::dependsUponSolution(), MayDay::Error(), CoefficientInterpolator< LevelData_, SolutionLevelData_ >::interpolate(), and CoefficientInterpolator< LevelData_, SolutionLevelData_ >::m_inCall. Returns true if the coefficient depends on the solution to the partial differential equation (rendering it nonlinear), false otherwise. By default, the coefficient is assumed not to depend upon the solution. Referenced by CoefficientInterpolator< LevelData_, SolutionLevelData_ >::interpolate(), and CoefficientInterpolator< LevelData_, SolutionLevelData_ >::interpolatePrime(). Computes the derivative of the coefficient with respect to the solution at the desired time. By default, this sets a_deriv to 0.
a_prime The coefficient derivative data will be stored here. a_time The time at which to compute the coefficient data. References CoefficientInterpolator< LevelData_, SolutionLevelData_ >::dependsUponSolution(), and MayDay::Error(). Referenced by CoefficientInterpolator< LevelData_, SolutionLevelData_ >::NewtonRaphson(). This virtual void method performs the iterative nonlinear solve for . a_phi The solution to the equation, , will be stored here. a_f The term in the equation. a_time The time at which the equation is solved. a_phi0 The initial estimate for . a_tolerance The threshold for the error in the equation that dictates when iteration should cease. This helper method solves the nonlinear equation for using Newton-Raphson iteration. It can be used by subclasses to implement the solve() virtual method. References A, Abs(), CoefficientInterpolator< LevelData_, SolutionLevelData_ >::interpolate(), CoefficientInterpolator< LevelData_, SolutionLevelData_ >::interpolatePrime(), max(), Max(), and min(). Referenced by CoefficientInterpolator< LevelData_, SolutionLevelData_ >::numComps(). Referenced by CoefficientInterpolator< LevelData_, SolutionLevelData_ >::interpolate().